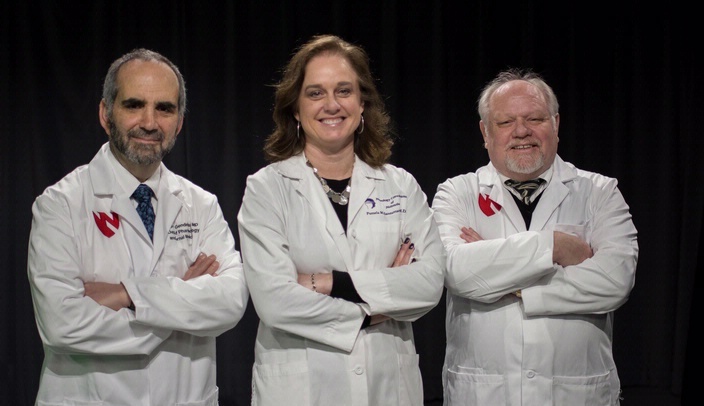 The three key people on the Phase I clinical trial were (left-right) Howard Gendelman, M.D., Pamela Santamaria, M.D., and R. Lee Mosley, Ph.D. In an early phase human clinical trial, researchers at UNMC tested a drug that transforms the immune system for diagnostic and therapeutic gain in Parkinson's disease (PD). To conduct the Phase 1 clinical study, scientists partnered with 14 academic and community-based physicians and neuroscientists with extensive expertise in neurophysiology, bioimaging, clinical trials execution and movement disorders. The research was conducted in basic science laboratories at UNMC and Scripps Research Institute in La Jolla, Calif. The study subjects were seen at UNMC's clinical partner, Nebraska Medicine. Clinical support was overseen at UNMC by Pamela Santamaria, M.D., a Nebraska Medicine neurologist and founder of Neurology Consultants of Nebraska; Danish Bhatti, M.D., assistant professor in the department of neurological sciences; and by David Standaert, M.D., Ph.D., professor and chair of neurology and director of the division of movement disorders at the University of Alabama at Birmingham. Using a blinded clinical study approach for investigation, the patients, their caregivers and their physicians could not tell whether the drug or a placebo was being administered. For more information on the study, call 402-559-6941. The medicine was proven safe and generally well tolerated. Side effects were minimal, but included skin irritation, bone pain and an allergic reaction. Preliminary evidence of improvement in motor skills was observed and recorded in several of the treated patients, but validation will require larger patient enrollments. PD ravages nearly one million Americans and generates direct and indirect costs of nearly $25 billion per year in the U.S. alone. The findings - which appear today in the journal npj Parkinson's Disease - mark a milestone for PD research. At the heart of the discovery was the immune transformation of disease-inciting circulating white blood cells (called effector T-cells or Teff) to cells that protect and defend against brain injury (called regulatory T cells or Treg). The drug changed neurodestructive Teff into functional neuroprotective Tregs. The research team was headed by two UNMC scientists, Howard Gendelman, M.D., professor and chair of the department of pharmacology and experimental neuroscience, and R. Lee Mosley, Ph.D., pharmacology and experimental neuroscience professor and head of the Movement Disorders Research Laboratory. The discovery results from more than two decades of laboratory and animal investigation. The idea was conceived in cell studies then validated in animals. During each step, immune transformation was realized with the drug granulocyte macrophage colony stimulating factor (also known as Sargramostim® Sanofi-Genzyme Pharmaceuticals). Importantly, such drug-induced transformation has not only been successful for PD but also holds promise for a range of neurodegenerative disorders that include Alzheimer's disease, stroke and amyotrophic lateral sclerosis. The drug was found to produce significant and encouraging changes in the production of Treg cells in the blood of patients. These same changes did not take place in patients who received the placebo. Initial clinical observations proved encouraging and varied in intensity between patients, Dr. Gendelman said. During the trial, physiological brain improvements were seen in specific motor areas of the brain for those patients receiving Sargramostim. This was recorded through the use of magnetoencephalography by a research team headed by Tony Wilson, Ph.D., associate professor and vice chair, basic/translational research for UNMC and director of the Magnetoencephalography Laboratory in the department of neurological sciences. Blood metabolites known to increase the number of neuroprotective Treg cells were observed in parallel studies on the same blood samples used to record the immune biomarkers. These biochemical studies were performed at the Scripps Research Institute by Gary Siuzdak, Ph.D., professor and director, Scripps Center for Metabolomics and Mass Spectrometry. Doses of L-DOPA and other dopamine-sparing drugs used to treat PD were continued to all study subjects throughout the study. "To our knowledge, this study represents the first time immune transformation was performed on any patient with neurodegenerative disease," Dr. Mosley said. Dr. Gendelman said the next step will be a broader study that will include larger patient numbers. This is being planned in the next one to two years, he said, after the manufacture of an oral medicine. Congratulations and well done. This is exciting news and gives me hope that future generations may be spared the terrible consequences of PD, Alzheimer's and other related neurodegenerative disorders that many of us have seen first hand in friends and family. "This is an interesting early study that could have implications for how we view and treat Parkinson's disease (PD). For more than a decade, immune function has been believed to be tied to disease. If validated in larger numbers of patients and by others, the recognition that peripheral immune cell dysregulation may contribute to disease progression would open new avenues of investigation. This includes investigation of the potential of other FDA-approved immunomodulatory strategies that can restore balance in peripheral immune cell populations that we know have the capacity to traffic to the brain to slow down PD progression and for other neurodegenerative diseases." "Disease modifying treatments for Parkinson disease (PD) are a vital unmet need. There is gathering evidence that the immune system plays an important role in PD progression. This study tests the safety of a potent immune modulating drug, granulocyte macrophage colony stimulating factor or GMCSF. The drug appears well tolerated as used in this study, and there are clear indications of potentially beneficial immunomodulation. The next step is validation in a similarly controlled trial involving larger groups of patients. Early indications of motor skill improvement observed in the current report will require larger scale validations." "Drs. Gendelman and Mosley have taken an important first step in applying immunotherapy to harness neuroinflammation in Parkinson's disease. The ability to increase regulatory T-cells is an exciting therapeutic approach for patients with Parkinson's disease and will hopefully translate into long-term beneficial outcomes."